Ok, the plot is as follows, Mike Nelson (Lloyd Bridges) wears swimming trunks, Mike Nelson gets wet, Mike Nelson saves people and things that are underwater etc, etc. In all fairness there was a bit of structure, he was a ‘for hire’ professional scuba diver whose services were required by everyone from children who had lost things, law enforcement to solve crimes, people looking for treasure, even the U.S. Navy occasionally required his services. By the way a lot of these adventures were pro bono and done just because he was a “good guy”. 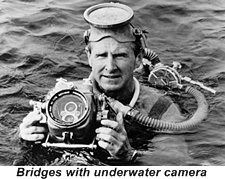 Bridges narrated the action during the underwater scenes so that we knew what was going on. He would also offer a short commentary at the end of each show, usually about protecting the oceans or other environmental topics. When the show started Bridges had never scuba dived before but by the final season he had grown so accomplished that he even did most of his own underwater stunts. 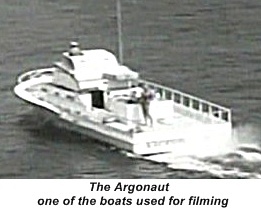 The show seemed to follow his progress with the first season having Mike Nelson as more of a land based investigator with scuba skills to the later seasons (2-4) where over half of the shows footage would be on or under the water. Real scuba tanks were too heavy for Bridges to wear during the land portion of diving scenes so exact replicas made out of balsa wood were constructed. 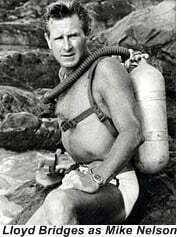 Since scuba divers don’t wear hats either black or white to differentiate the good guy from the bad guys Mike Nelson always used a double hose regulator and the bad guys used single hose models so you could tell them apart. The other advantage was that double hoses exhaust the exhale (bubbles) behind the diver so they wouldn’t block any close up camera shots of Bridges underwater.